See how KONE, a global leader in the elevator and escalator industry, uses Visual Components to improve productivity and reduce time to market. Read more! With 14 factories, 55,000 employees and 2017 sales of EUR 8.9 billion, KONE is a global leader in the elevator and escalator industry. The Finnish-based company provides elevators, escalators and automatic building doors, as well as solutions for maintenance and modernization, which add value to the life cycle of any building. As KONE has grown over the years, so has the demand on their factories. 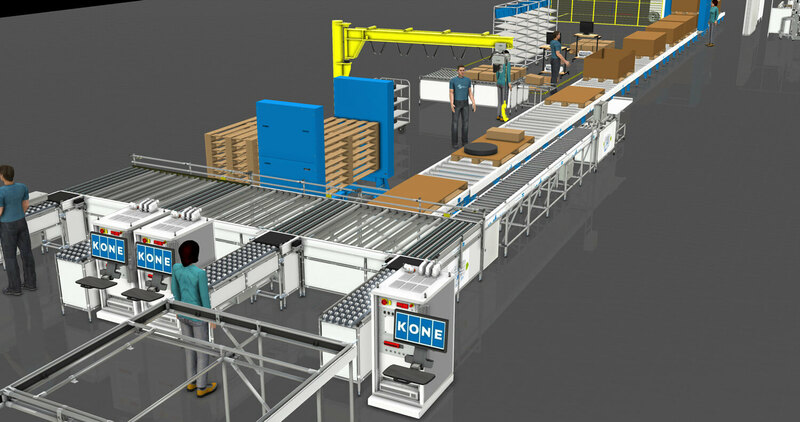 “A bit more than a year ago, we saw the need to change how we communicated with our stakeholders about assembly cells planning,” said Miikka Ahola, KONE’s Manufacturing Solutions Manager for KSU Manufacturing Solutions. Miikka and his team decided it was time to look for a solution that could not only help them with planning and designing new production solutions, but also improve their communication with stakeholders during the planning and development process. “We were mapping potential solutions for simulation and layout planning for our factories and we wanted to have 3D layouts, as they help a lot in visualizing the layout and space requirements,” said Miikka. After conducting an evaluation of potential software solutions, Miikka and his team decided to move forward with Visual Components. “Using Visual Components was a lot easier compared to other products we evaluated. That was very critical to us,” said Miikka. Using Visual Components was a lot easier compared to other products we evaluated. That was very critical to us. KONE’s global development and planning team has its headquarters in Espoo, Finland; however, it’s truly a big and global team, and extends to all 14 factories. “We have a global development team responsible for technology and process development, which is supported by local teams in each factory, with their own development engineers,” says Miikka. All new R&D projects are first reviewed by the global team. They review the investments, technology, and manufacturability of projects in the first stage, then handover the product from R&D to production, and oversee implementation at KONE’s factories. “We work in the middle, making sure we have all the plans and investments done, and there is full readiness for production start-up,” says Miikka. For Miikka and his team, it was easy to incorporate Visual Components into their planning workflow. “Typically, we use Visual Components in the early stages of new product implementation projects. This helps us to present our stakeholders with a clear image of what type of manufacturing station or line is needed, and how much space is required to hit production targets,” says Miikka. New investment projects at the global development team typically begin with creating mock-ups of lines or stations. “We start with defining what we are going to make and put together a mock-up layout that has all needed lines and assembly stations, but might not be defined according to specific product needs. This helps us to define the space requirements to start with,” says Miikka. Once they’ve narrowed to a design they think will work, they move to create a layout. “We start to fine tune the individual stations and improve the ergonomics,” says Miikka. Next, they simulate the production workflow, validating production calculations and space requirements, and looking for optimization and cost saving opportunities. Having a visual tool to communicate these tradeoffs with stakeholders has been especially helpful for Miikka and his team. “We can visually show our stakeholders in R&D, product development, quality, and operations how changes in the design can reduce labor and equipment costs,” says Miikka. 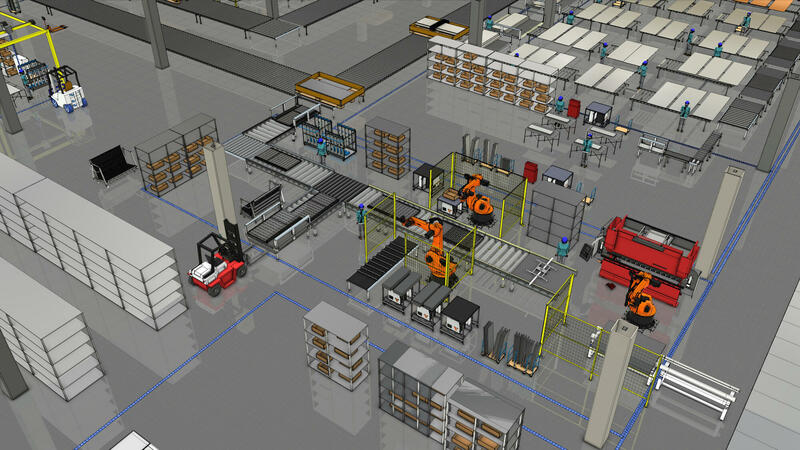 After getting management approval to proceed with the project, they use Visual Components export files, such as simulation videos, 3D PDFs, and 2D drawings, to facilitate communication with factories during implementation and deployment. We can visually show our stakeholders in R&D, product development, quality, and operations how changes in the design can reduce labor and equipment costs. As with many Visual Components users, Miikka and his team have found that having a large selection of components and layouts in their eCatalog makes it easier to start new projects. “Having a big component library is must have, so that new projects can be easily started,” says Miikka. “In this arrangement, both sides are benefiting,” says Miikka. Through KONE’s partnership with their system integrator, Miikka and his team have a steady stream of components and layouts they can use in their development planning process. They’re also better informed about the latest production technologies and processes. Having a big component library is must have, so that new projects can be easily started. For Miikka, the greatest benefit Visual Components’ software brings to KONE is the time it saves on the development process. It facilitates faster decision making and more efficient communication with stakeholders. It also helps them to reduce time to market. “Visual Components is helping us to start the manufacturing development process much earlier than before, and reduce critical time to market,” says Miikka. Miikka and his team are juggling a lot of simultaneous projects, from planning new factories in India to testing future technology concepts; and Visual Components is helping them to be more productive so they can meet the rising demand for KONE’s products. In the future, Miikka hopes to expand the use of Visual Components to their global factories. 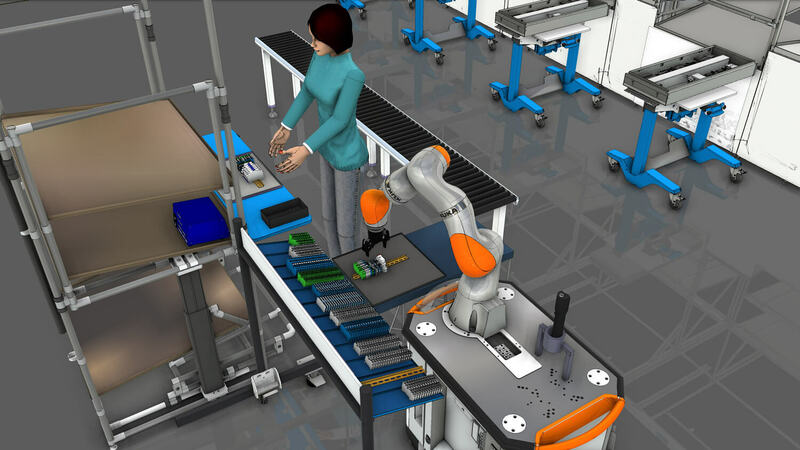 “We plan to implement Visual Components to our factories, so that local development engineers can use it to highlight changes, ideas, and suggest lean improvements with simulations,” says Miikka. Visual Components is helping us to start the manufacturing development process much earlier than before, and reduce critical time to market.